Rev. Ben Burt joined the Buncombe Street UMC family in June of 2017 as the Trinity Campus pastor. Ben is a cradle Methodist from New Jersey. He moved to South Carolina in December of 1998. Ben received his bachelor’s degree from Johnson & Wales University in 2002. He received his Master of Divinity from Lutheran Theological Southern Seminary in 2012 through their United Methodist track. He was ordained in 2014. 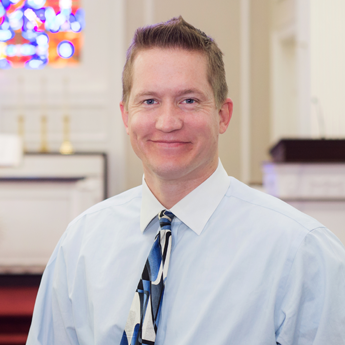 Prior to being appointed to BSUMC, Ben served at Epworth UMC on James Island. Ben’s wife, Danielle, is a stay at home mom. They have three and a half children: Peyton, Olsen (Bubba), Adeline, and Blue the dog. They all love Greenville, especially the zoo. Ben likes to spend his free time at the gym or chasing a little white ball on a golf course.